Welcome to Hall of Fame where each week we focus the spotlight on one of your favourite artists! Gaga has been around since 2001 and we all know her from her hit singles "Poker Face" and "Bad Romance". The 32 year old singer has sold 27 million albums and 146 million singles as of January 2016 making her one of the best-selling artists in history. Lady Gaga hasn't been in the charts a lot recently, only releasing one song "The cure" in 2017 and her most recent track "Your Song" released in March 2018. 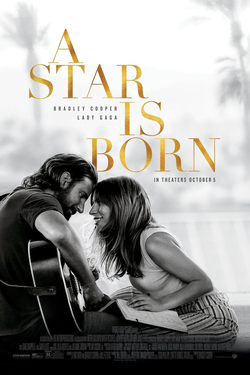 Instead she has been focusing on her acting career as she plays "Ally" in third remake of movie 'A Star is Born'. She worked alongside Bradley Cooper in the film and replaced Beyonce who dropped out of the production in 2012. The movie is set to drop in October. The singer hasn't been on any music related tours since her "Joanne Tour" which ranged between the end of 2017 and start of 2018, where she cancelled the remaining 10 shows including London and Manchester due to severe pain. Since then, she hasn't only been working in the acting business, she also accepted an award for her Born This Way Foundation which is a charity she co-owns that targets young people living with mental health issues. Gaga and her mother accepted the "Global Changemakers Award" at the Empathy Rocks fundraiser in California in June. The fundraiser hit's quite closer to home for the singer as she claims to have been suffering with mental health issues for a long time, publicly and non publicly. The charity brings people closer together to discuss their problems and open up. If you would like to find out more about the charity or get involved then head over here. Love life seems to be treating Gaga well too! The singer who is engaged to Christian Carino have been spotted multiple times together in the last few weeks including her lush holiday in the Hampton's, where she was happier than ever! A true star, Lady Gaga continue to amaze and surprise us.